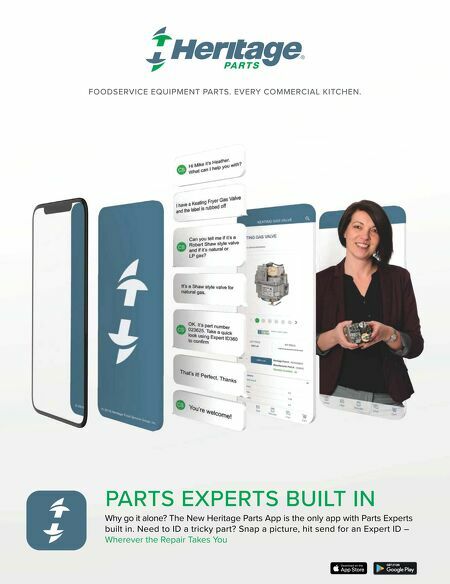 78 • FOODSERVICE EQUIPMENT & SUPPLIES • NOVEMBER 2018 Comprehensive Components When it comes to menus in this segment, operators continue to emphasize local and regional foods as well as small plates and shareable meals that appeal to many. Like the foodser- vice industry as a whole, locally sourced ingredients and food transparency are both trending in hotel foodservice. "People want to know where ingredients come from, and it's a good re•ection on the community's local businesses to provide this information," says Rigby. Large hotel chains like Marriott look to F&B to drive value for customer loyalty programs, for example, by provid- ing top-tier guests access to a private concierge lounge with free food and beverage. Milwaukee, Wis.-based Marcus Hotels & Resorts' Mar- cus Restaurant Group, which develops and operates concepts that range from casual to „ne dining to lounges, seems to have hit on a successful formula. Its award-winning restau- rants include the city's Miller Time Pub & Grill, Chop- House, Mason Street Grill and SafeHouse Restaurants. It's the morning daypart, however, that takes precedence at the nearly 40 F&B operations inside its 21 U.S. hotels. Breakfast serves as the primary touchpoint for hotels trying to reach the majority of their guests, according to Technomic. As such, it is the largest revenue driver (from a daypart perspective), accounting for 37 percent of total rev- enues (and higher among midscale and economy properties.) It remains the one daypart that provides a captive audience for hotel F&B programs and operators increasingly view it as a differentiating factor. "Health, wellness and global food trends are having a sig- ni„cant in•uence on breakfast menu offerings; breakfast is a very important part of our operations, as we see more guests at breakfast than lunch or dinner," says Joe Jackson, Marcus Hotels & Resorts' corporate director of food and beverage. Earlier this year, Marcus Hotels hosted a breakfast-fo- cused workshop for some of its chefs and operations direc- tors. "We focused on creative breakfast beverage offerings, including introducing cold brew and nitro coffee to the menu," says Jackson. "Our teams are, if they don't already have it, now adding cold brew or nitro coffee to our menus, which will be available all day, not only at breakfast." Flexible Equipment When it comes to the back of the house, space conservation remains a key consideration. Multifunctional equipment that „ts into a small footprint takes priority. "In our business, we need big results from small equipment," says Jackson. "From speed to combi ovens, we like equipment with cooking diversity, quick prep times and most importantly, equipment that is easy to use." Marcus Hotels' restaurants also seek equipment with technology that provides the •exibility to deliver meals on time. "Programmable and smart ovens are becoming more and more prevalent in kitchens and in our markets, too," says Jackson. Like other hotel restaurants, the line in many Marcus Hotels' kitchens does many things in addition to the regu- lar restaurant menu, like supporting the banquets, bar and lounges, room service and the pool. And in some cases, the line supports two separate restaurant concepts. 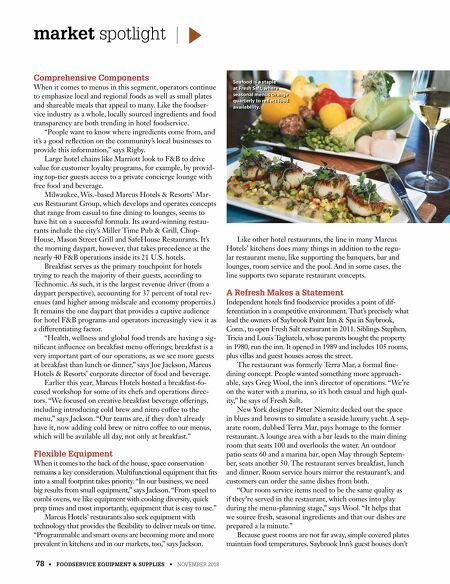 A Refresh Makes a Statement Independent hotels „nd foodservice provides a point of dif- ferentiation in a competitive environment. That's precisely what lead the owners of Saybrook Point Inn & Spa in Saybrook, Conn., to open Fresh Salt restaurant in 2011. Siblings Stephen, Tricia and Louis Tagliatela, whose parents bought the property in 1980, run the inn. It opened in 1989 and includes 105 rooms, plus villas and guest houses across the street. The restaurant was formerly Terra Mar, a formal „ne- dining concept. People wanted something more approach- able, says Greg Wool, the inn's director of operations. "We're on the water with a marina, so it's both casual and high qual- ity," he says of Fresh Salt. New York designer Peter Niemitz decked out the space in blues and browns to simulate a seaside luxury yacht. A sep- arate room, dubbed Terra Mar, pays homage to the former restaurant. A lounge area with a bar leads to the main dining room that seats 100 and overlooks the water. An outdoor patio seats 60 and a marina bar, open May through Septem- ber, seats another 50. The restaurant serves breakfast, lunch and dinner. Room service hours mirror the restaurant's, and customers can order the same dishes from both. "Our room service items need to be the same quality as if they're served in the restaurant, which comes into play during the menu-planning stage," says Wool. "It helps that we source fresh, seasonal ingredients and that our dishes are prepared a la minute." Because guest rooms are not far away, simple covered plates maintain food temperatures. Saybrook Inn's guest houses don't market spotlight Seafood is a staple at Fresh Salt, where seasonal menus change quarterly to reect food availability.